Champagne chicken entree from Baker dining a couple of days ago: 4 oz. 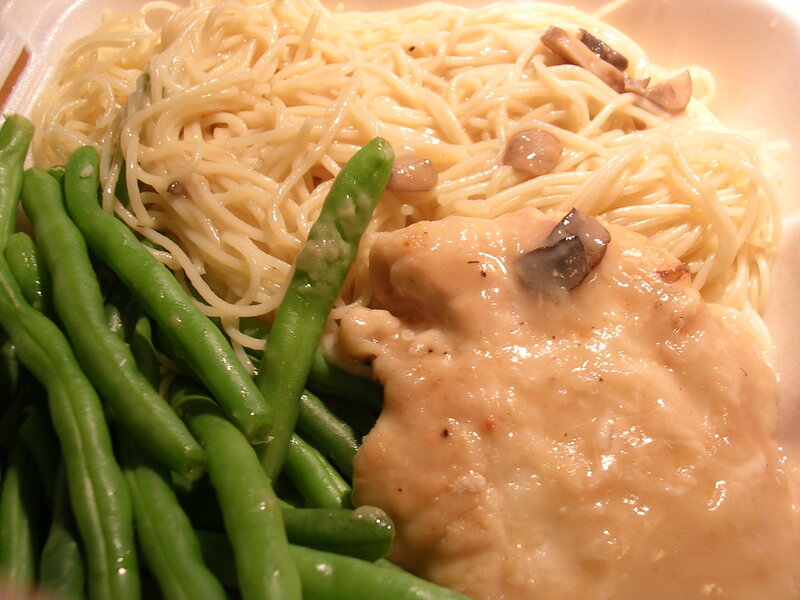 chicken cooked in champagne sauce (250 calories), 1.5 cups of angelhair pasta (300 calories), 1 cup of green beans (40 calories). I bought this entree the day that I got the sushi, because I thought it would be a good idea to have some food for yesterday morning before my exam. Of course, you know that I had barely any time to eat anything at all that morning, so it became today's lunch. The chicken smells very champagne-y haha, when I first got it I was standing outside the dining hall wondering where the smell of alcohol was coming from. I wonder if anyone in lecture noticed today lol. It's interesting, apparently since I didn't eat all that much yesterday, today I was literally starving to death before I ate lunch. It was almost nauseating just walking from the dorm to the class, you know how it gets when you get too hungry? Guess you feel the effects the next day. I should take care to eat something later at night if I am going to stay up really late, I guess it's just hard because everyone always says eating late at night and before bed is generally a bad idea. I read that technically it doesn't matter when you eat because your body will deal with it in the same way, but I have also read that part of the reason for the well known freshman 15 phenomena is the fact that we stay up late and eat stuff late at night when we are stressed out. So who's really right? 1/2 of tilapia almondine entree: 3 oz. 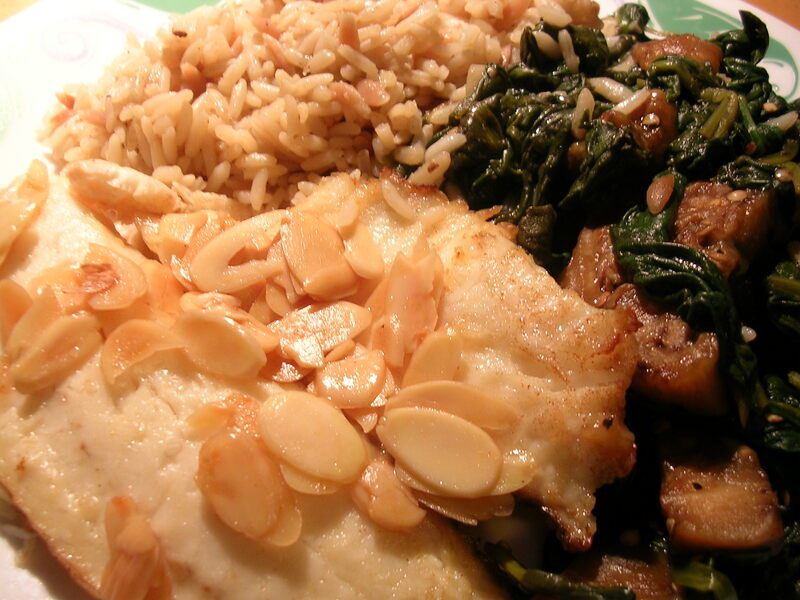 tilaplia almondine (150 calories), 3/4 cup of rice pilaf (170 calories), 3/4 cup of sauteed spinach and eggplant (~70 calories). The sauteed spinach and eggplant look kind of gross, sorry. I saved the other half of the entree for another day, maybe lunch on Saturday or something. Later tonight Baker is having a pizza bagel happy hour… which means drinks and pizza bagels, of course! Not great for you, so I'm trying to open up some room for it in today's tabulation. 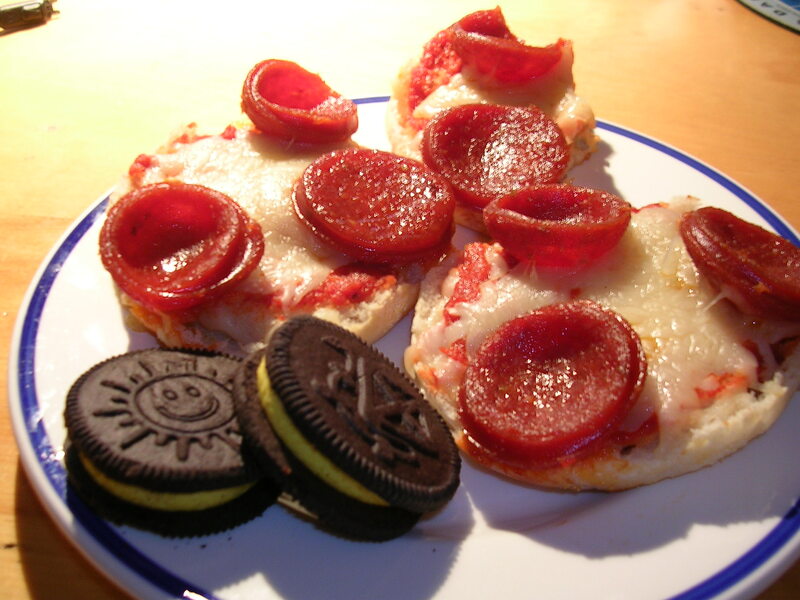 3 homemade pizza english muffins with mozerella and pepperoni on top (450 calories), 2 spring fling oreos (100 calories), 1 cup of Diet Coke. Wow the pizza bagels were really good, especially since they were made on english muffins. I think if they were really on bagels it would be too tough and desnse. But the airy-ness of the muffins made it perfect. And the thick pepperoni slices on top were definitely a treat. Mmmmm…. Total for today is 1530. On the high side, but still managed to be lower than the daily needed number of calories, so I'm still in the green. I got 45 minutes of sleep tonight, total, because I was rushing to finish a 7 page paper which I started at 2am. Super exhausted and stuff. This entry was posted on Thursday, March 22nd, 2007 at 9:26 pm	and posted in American, French, poultry, rice and pastas, seafood, snacks, Uncategorized. You can follow any responses to this entry through the RSS 2.0 feed. you are the next food network star and beyond, all set to squander the very Emeril! I am from Poland and at the moment I live/work/study up in NYC. I am a real food fanatic although not a very talented cook. you are being very fastidious about each aspect you are trying to tackle.